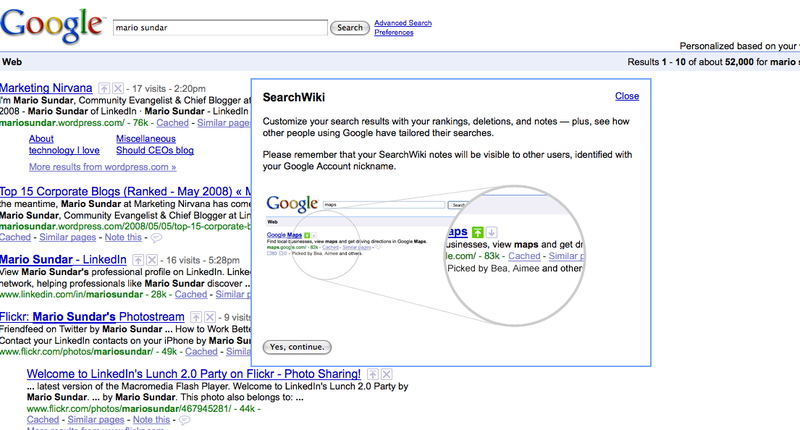 What can Google’s SearchWiki do for you? It’s a big deal, it’s awkward, it’s frightening, it’s brave, it’s already both loved and hated. News Feed will use this feedback to further tailor stories for you and to identify the types of stories and applications you might like to see in the future. Starting today you can do all this and tailor Google search results to best meet your needs. For Google it’s also a great way to provide you more targeted results and hopefully a more personalized experience within your Google account. What’s also interesting is the ability for you and other users to comment, submit other URLs for the search item you’re looking for. Hopefully, this will also enhance the accuracy of search results for everyone. I think SearchWiki is a good thing – as much as Google can tweak their search algorithms, spammers always try to game the algos and get listed. Nothing beats ratings given by real human consumers of web pages! I also think it’s a great way to offer customized search results for millions of users. I think that’d be a killer side-effect of the search wiki itself.